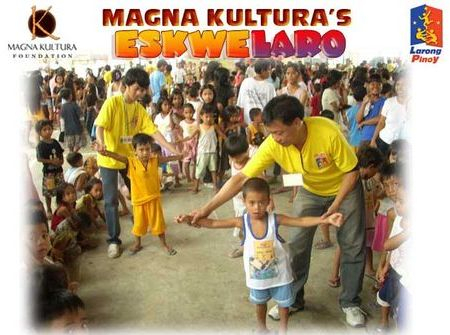 Amidst the age of computer games, Magna Kultura launched the Play Camps to promote active outdoor play, and to open an avenue for children to play with neighborhood friends. To make Larong Pinoy relevant, first and foremost, an awareness for the game mechanics must be taught among children, in schools and communities. 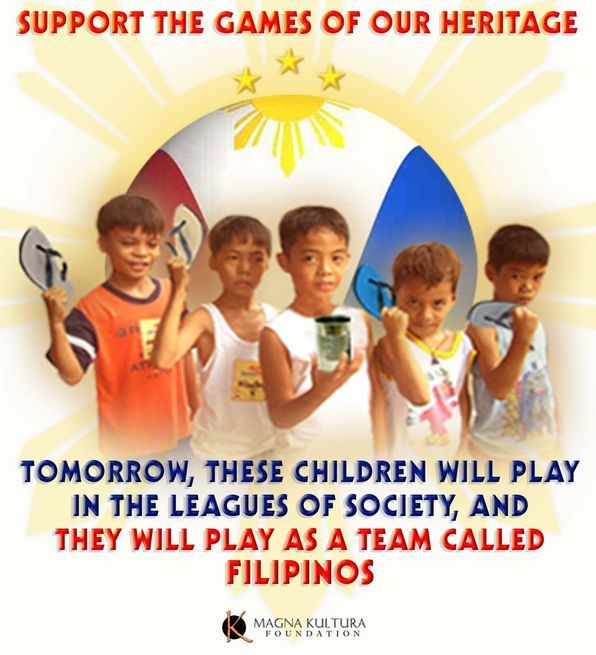 The Larong Pinoy Play Camps are conducted by Magna Kutura Foundation to sustain the games, and as a way to foster appreciation of Filipino culture among the new generation of Filipino youths. The clinic teaches students the popular traditional Filipino street games games like Patintero, Tumbang Preso, Piko, Luksong Tinik and other Pinoy games. The sports clinic features scientific drill instruction methods and a mini-tournament session for hands-on application. The Play Camps are conducted in a sports clinic fashion teaching detailed mechanics on how to play each game --- and we call it "Eskwe-Laro©". It's fascinating to see the kids to each drill exercise, giggling their way through each task. The 'scientific' methods for teaching Larong Pinoy is something never before done in the history of the games. In reviving the Games Magna Kultura created a Sports Clinic to create awareness for the game mechanics; teaching the new youth generation children, in schools and communities. The Game Clinic activities is a sports education program advocating the traditional Filipino street games, Larong Pinoy! Kids come together in the Sports Clinic along with their neighborhood playmates and personally sign-up at the registration table. The are open to children with ages 3 to 12 years old, and for teenagers as well. Most of the children who line-up in our Sports Clinics to have inter-active fun and play --- taking time-off from their computers or high-tech game gadgets at home. There are many benefits that play offers in the lives of children: it's healthy as they become physically active; it's also social, as they build strong camaraderie with their neighborhood friends. Playing the Pinoy games are convenient and inexpense. We believe that once children learn to play these games it will build wholesome camaraderie among kids in the neighborhood, bring back the fun and enliven communities, at the same time create bonding among parents and grandparents about games they which they are familiar with. Amidst modernisation, the games are very much alive today. Most of the kids spend their afternoons playing in the streets. (Like when you pass by in an urban depressed are you'd comment, "wow, factory ng bata...", because they're all out in the streets and your car could barely pass by). We can see the joy in the eyes of parents and grandparents as they watch their children take part in the Pinoy game activities. They are full of "thank you's", aside from receiving a free clinic for their siblings, they find that they have something to talk about with their children at home, especially during dinner time. The activity transforms people, transform places. It revives a way of life and fun in communities. We are passing on something that children will remember forever in the lives. And we believe that long after the Sports Clinic left their community the legacy will live on, in their barangays and among their children's children. Like their lolo's and lolas' they will be able to say, "Yan ang laro namin noong bata pa kami..."
Magna Kultura Foundation is using Larong Pinoy as a cultural solution. Instead of lecturing kids on about Patriotism and family bonding --- through "play" we let them experience the Filipino Spirit. In a creative and fun way, we instill Patriotism, and make them realize that the games are Heritage Games played by their parents, their grandparents, and that these are truly Filipino games. We also make them proud to be playing a game that has been passed on from generation to generation. 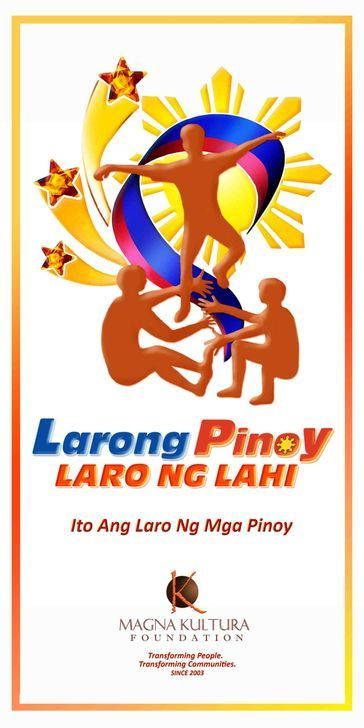 Larong Pinoy makes them proud to be part of the rich Filipino heritage. The advocacy of the games is a worthwhile program. To make Larong Pinoy relevant, first and foremost, an awareness for the game mechanics must be taught among children, in schools and communities. Thus, Magna Kultura created the sports clinics. Secondly, there must be an avenue for competition, where players can demonstrate their skills. Finally, a sports marketing enterprise must be built around the games. An enterprise that can be beneficial and/or profitable for “mobilizers”, whether it be through tournament prizes or marketable goods. 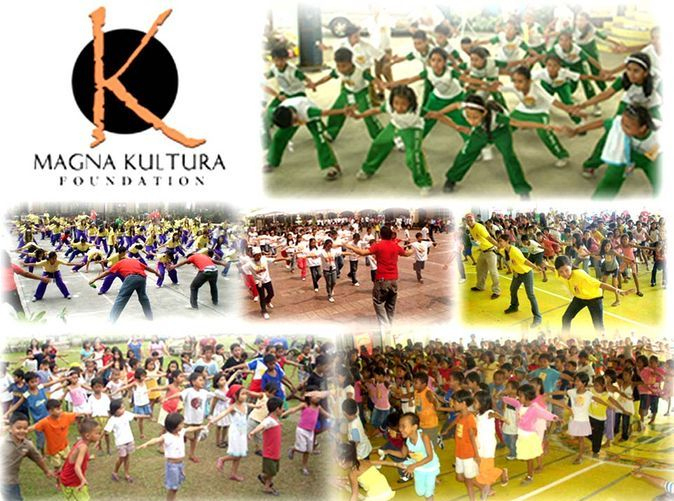 Magna Kultura is promoting the games in Barangays, Schools, and even among private companies. Sports Clinics and tournaments are held in schools and Barangays; and local comapnies are using the games as platform for company team building activity.